Softcover: 192 pages, maybe 600-700 color illustrations. 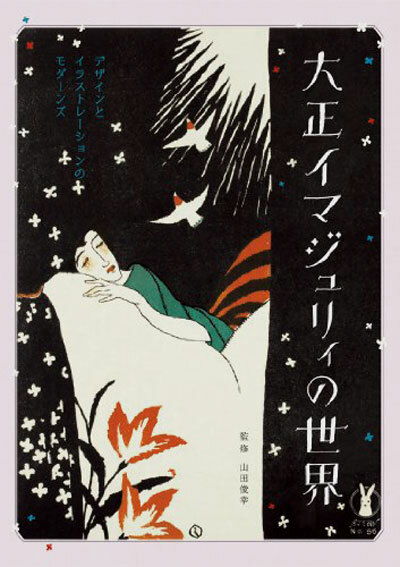 A fine overview of the pictorial graphical design, illustrations, prints, postcards and stationery items published in the Taisho period. Artists mentioned in this catalog includes; Sugiura Hisui, Takabatake Kasho, Takahashi Haruka, Fukiya Koji, Hashiguchi Goyo, Maeda Masao, Kobayashi Kaichi, Takehisa Yumeji, Tachibana Sayume, Okamoto Kiichi, Koga Harue, Fujishima Takeji, Sakamoto Hanjiro, Tomimoto Kenkichi et alia. Many them of given their own short essay plus 5-20 representative works. Several different areas of graphical design and fine art prints are not covered in this publication, for example, fan prints, both "fine art" fans as well as promotional, scant on advertisements, posters and similar. There are also some glaring omissions among the artists of the period, for example, Takeuchi Seiho, and many different Nihonga artist which also worked with graphical design, as well as many artists associated with the Sosaku hanga and Shin hanga movements. However this catalog is so far the best overview of the subject, it should be in the library of any body interested in the art of this period. and a multitude of other important and less important artists of the period.